Michigan, Ohio, Indiana and Chicago area residents are in luck. 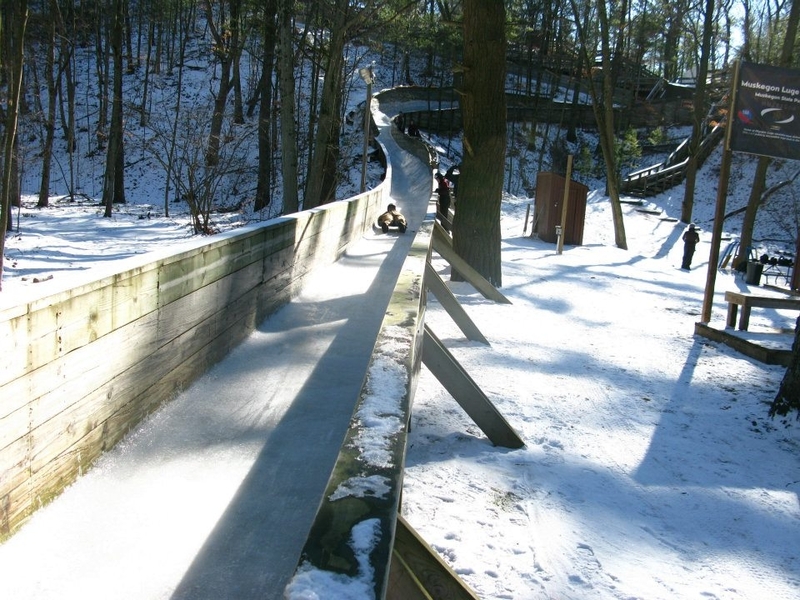 Muskegon Winter Sports Complex, southwestern corner of Michigan, offers one of only four luge tracts that exist in America. It’s open to the public winter weekends, Saturday and Sunday. The cost is $49 per person, per session, which entitles you to as many runs as you can get during a session. Most get 3 to 6 runs. You get a 30-45 pound sled, which you have to carry back to the top of the slide. You also get a helmet, forearm pads and a 15 minute training period with a coach at the beginning of your session. Be sure to have with you a proof of health insurance. Luge tickets must be purchased in advance through their online reservation system, and weekends sometime sell out. The 850-foot track, shorter overall than the Olympic version, has been used for training by Olympians, and Olympic medalist Mark Grimmette got his start here. Public participants slide from the three-quarter mark on the track, but still reach speeds up to 30 mph on the way down. They say the track is designed for public participants and those who haven’t tried it. In addition to the Heartland’s only luge track, the Sports Complex also offers skating, sledding—plain old sleds down a hill—and the longest lit, groomed cross country trail in the Midwest. The 16-kilometer trail gently winds through woods, along dunes and Lake Michigan, and Lost Lake Bog. They offer rental equipment and lessons if you desire. A complete list of nearby lodging options is available on the Muskegon County Convention and Visitors Bureau website. On the way home from the weekend trip add a day on the slopes at one of three nearby southeast Michigan ski areas. Cannonsburg is about an hour east of Muskegon, and both Timber Ridge and Bittersweet are about an hour-and-half south. It’s not your typical winter weekend getaway, but a great way to get ready for the ultimate winter games.